THE TOKYO ART BOOK FAIR 2015, the fair’s 7th annual edition, will gather over 300 bookmakers from around the world. New content for this year, includes “Guest Country”, “International Section” and at the invitation of TABF, the attendance of Irma Boom, one of the world’s most admired contemporary book designers. 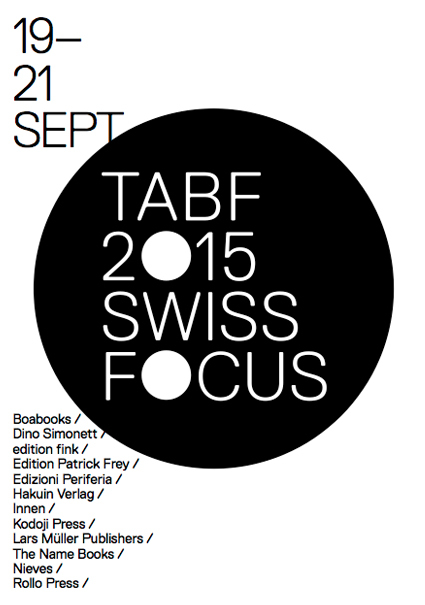 With strong international attendance, 12 exhibitors from this year’s “Guest Country” of Switzerland and a collaborative event in cooperation with art book fairs in New York and Amsterdam held over the same weekend as TABF, this year’s fair is one of TABF’s most international gatherings thus far.Other notable events include the exhibitions, “The Most Beautiful Swiss Books” and “Irma Boom Books”, talk programs, book signings and visitor participatory events. For three days, you are as ever welcomed to take advantage of the opportunity to experience art publishing as it is in the here and now, what it has been, will be and might be from here on out.